At 29,000 SF and less than eighty dollars per square foot, Phase One was developed for ease of future westerly expansion and to take economic advantage of a pre-engineered frame and cladding package placed simply on the land. Not unlike the traditional Midwestern barn found alongside country roads, the architecture stands as an isolated object in the landscape. The front foundation wall, curved and asymmetrical, enables visual frontage on two sides, and retains the earth for lower level educational rooms that no longer function as barn stalls. The approach road rises to meet the primary entry for formal upper level spaces, while the white metal clad skin, formally, and symmetrically, stands before you. Tractors pulling trailers loaded with hay are still welcome here, but the primary uses are for worship, community dinners, and an administrative home to the clergy. 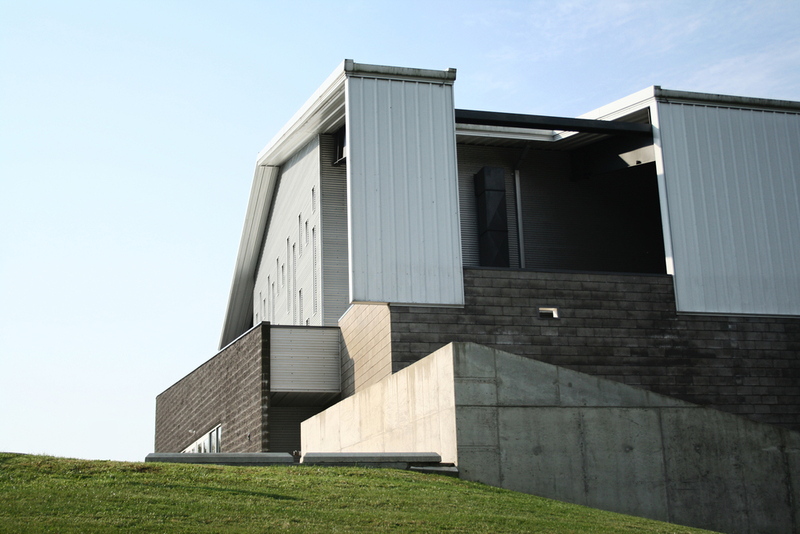 The building skin's symmetrical purity is broken by the stair armature that distributes congregants gathered from the parking area or returning from the playfield.